Many geographical facts are given within “The Histories”, some deliberately others by virtue of naming a town and its province as part of a storyline. The deliberately given facts are analysed and thus the knowledge of the Greek World c460-430BCE is explored and tested against other original texts which are available today. “The Histories” are chronological and thus the geographical data can only be extracted in text order which passes back and forth across the landscape. There is no attempt here-in to analyse every single geographical fact given. “The Histories” is however an important historical document which should be read in its entirety. PENGUIN CLASSICS; HERODOTUS, “THE HISTORIES” Translated by Aubrey de Selincourt and revised with an introduction and notes by A. R. Burn. The 1976 edition then cost £1.15. I have used this text and hope it encourages students of geographical history to purchase and use it to infill the large sections not used which contain excellent historical facts required for a full understanding. He is known as the “Father of History”, not because he was the first historian, but that his text and methodology far surpassed all others. He was writing at a time of turbulence in the Greek World with constant battles against the Persian Armies, and even internecine strife. He began writing his text after self-imposed exile on the Island of Samos, in the Aegean Sea. It is west of Ephesus. Robert Payne, in his book, “Triumph of the Greeks”, sums up as follows; “We do not know when he set out on his travels, and we can be sure of only a few countries he travelled in. He evidently knew Samos well, and had a great affection for the island. He certainly visited Egypt, but we have no means of telling how long he spent there or whether he went up the Nile to Assuan. (See 2/25-29) He seems to have known the coast of the Black Sea and to have been in Arabia, and he knew the various kingdoms and principalities of Asia Minor well. He talks at considerable length about Cyrene without ever quite convincing us that he knew the city at first hand. 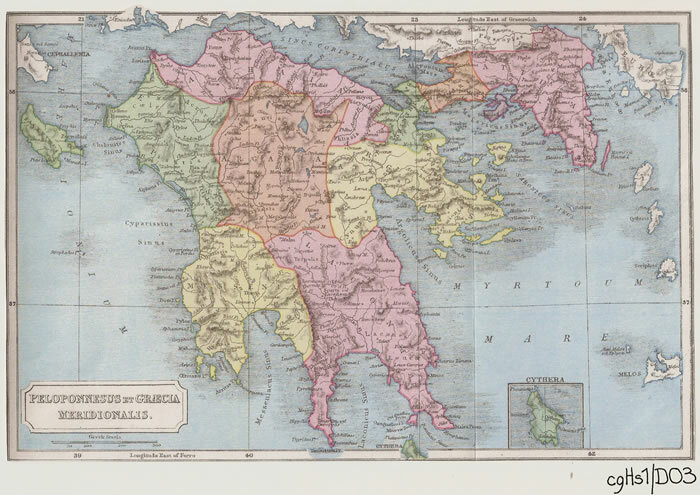 Had a geographer written a complementary text, such as Pausanias’ “Description of Greece” which is used here-in to supplement the text of Herodotus when he describes the northern Peloponnese, we would probably understand the works of Geographers such as Hecataeus of Miletus; Dicaearchus; Eratosthenes; Posidonius; Pomponius Mela and Marinus the Tyrian, far better than at present. From 750BCE, the Greeks gradually expanded from their homelands to the littorals of the Black Sea, Anatolia and the near lands of Southern Italy and Sicily. However Miletus, the mother city of the Ionians was predominant in its expansion and settlements, having perhaps over 90 spread around those coasts. Thus Hecataeus of Miletus, c550-476BCE, was able to write his books entitled, “Ges Periodos” or ‘Travels round the Earth/World Survey’, as a Periplus or point to point coastal survey. Unfortunately, the books only exist in fragmentary pieces. His world map, reconstructed from those pieces is of a circular world surrounded by Ocean. Herodotus has commented upon this representation of the world as will be discussed. Suffice it to say it is not accepted. The home city of Herodotus is Halicarnassus (now Bodrum). It lies on a promontory of Anatolia, on the southern Aegean coast of Asia Minor, and is c60Km south of Miletus. It was the capital of Caria and founded from the city of Troezene in Argolis and is therefore a Dorian Colony. 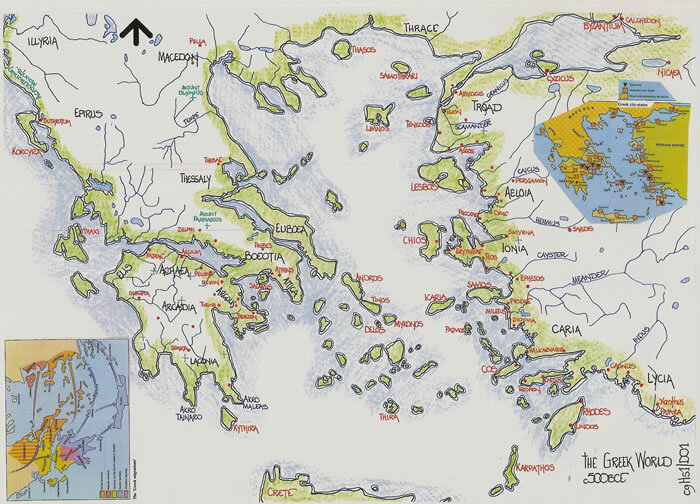 The northern Greeks settled along the upper coast of Asia Minor, which became known as AEOLIS. The IONIANS from southern Greece colonised first the southern coast of Asia Minor before spreading along the littoral of the Mediterranean Sea and then the Black Sea. The Ionians were the most versatile of the Greeks, being inter-racial peoples who produced the likes of Homer, and also scientific enquiry and philosophical thought. Herodotus is not exactly kind in his statements concerning the Ionians. From 500BCE to 480BCE there are various wars including the Ionian revolt which in 494BCE resulted in the destruction of Miletus by the Persians. We then know that in September 490BCE there was the battle of Marathon where the Athenian army defeated the Persians. The significance of this defeat of the Persians was their expansionist aims were abandoned and the Greek Civilisation we know of was able to stabilize and flourish. Then is formed the Delian League of Athens and the Ionian cities. But by 448BCE there is peace between Athens and Persia such that the Greek Cities of Asia Minor and Cyprus remained within the Persian Empire but retained their autonomy, and the Aegean Sea was declared a Greek body of water. Thus the Delian League was no longer required and the Athenian Empire was established with the age of Pericles now dominant. This is the period Herodotus was in Athens reading the text of his ‘Histories’ to the populace. “When he (Cyrus) reached the Halys, he crossed it by the existing bridge; that, at any rate, is my own belief in spite of the common Greek story that it was Thales of Miletus who contrived a crossing. The tale supposes that the bridge had not yet been built”— and that Thales diverted the river by digging a crescent shaped channel to split the river in two and form easy fording points. The River Halys is one of the great rivers of Anatolia, today the Kizilirmak. Herodotus has described it quite accurately but that description also indicates the possibility of changing territorial boundaries. Rising in Armenia, which would have been Median territory; it is then described as passing through Cilicia. This has always been portrayed as a territory bounded on the north by the Taurus Mountains and accessed from the north via the Cilician Gates. Thus we can perhaps accept a mingling of territorial boundaries which may actually have been quite nebulous unless they were a physical entity. The River Halys was the boundary of the Median Empire stretching from the east. The Kingdom of Lydia encompassed the rest of Anatolia except the coastal fringe which was basically the Greek City States. These were the Ionian City States which stood against the Persian invasion until 493BCE, having previously spread far and wide around the Black Sea and Aegean Littorals between 750 and 550BCE. The Persian invasion led to a battle at Pteria, in 547BCE and the defeat of the Lydians thus making their lands a province of Persia with Armenia, Cappadocia, Assyria, Cilicia, Ionia and the littoral of the Black Sea and Aegean Sea. The Achaeans, who in fact ejected the Ionians from their original homelands, those of the Littoral to the Gulf of Corinth in the northern Peloponnesus, did not expand further than to found several minor colonies in Thrace. The River Halys, as can be seen on the diagram is a curved form on the landscape of Anatolia. In fact there is a large river system contained within its course. If there was an existing bridge as Herodotus states, it would have been on a major trade route. The port of Samsun, ancient Amisus, was a Milesian settlement and has to its southwest the ancient Hittite settlements of Hattusas and Yazilikay. These settlements altered considerably during their life and we read in Old-Assyrian texts and later Hittite texts of c1900BCE, the city was called Hattush. It is now Bogazkoy, which is situated next to the ancient city. The city lies at the south end of a long wide valley. From south to north a small river, the Budakozu flows through the valley. The Budakozu empties into the Delicesu, a tributary of the Kizilirmak, making it part of the river system of the Halys. It is therefore possible that the whole system was the Halys, not just the single river. Between 650 and 500 BCE, Bogazkoy must have been of importance far beyond its immediate region. There is evidence for this in the layout of the city and in some monuments of high quality that have been discovered. Assyrian and western imports testify to foreign relations. The old Hittite name Hattusha seems to have been forgotten soon after its destruction. It is not used any longer, not even in modified form. Pteria, mentioned by Herodotus, Book 1; 76, as being “more or less in line with Sinope”, was a large city with important territories and might be identified with Bogazkoy of the 6th century BCE. However, there is no proof that Pteria was Bogazkoy! But it is possible that the bridge was on the route south from Bogazkoy towards Cilicia and the Mediterranean Sea and it is thus the Persians arrived from Cappadocia into this territory. “This ancient custom was openly defied by a Halicarnassian called Agasicles, who, after winning his tripod, took it home and fastened it up on the wall of his house. In punishment for this offence the five cities of Lindus, Ialyssus, Camirus, Cos, and Cnidus excluded Halicarnassus (which was the sixth) from the temple priviledges. The reason why the Ionians chose the number twelve for their Asiatic settlements and refused to increase it, is, I fancy, the fact that they were divided into twelve states when they lived in the Peloponnese, just as the Aechaeans, who drove them out, are today. Of the Achaean cities, that nearest Sicyon is Pallene; then comes Aegira, then Aegae on the Crathis, a stream which is never dry and gave its name to the Italian Crathis; then Bura and Helice (where the Ionians took refuge after their defeat by the Aechaeans); then Aegium, Rhypes, Patres, Phares, and Olenus (on the large River Pirus); then Dyme and Tritaees. Of these only the last lies inland. Those, then, are the twelve settlements in Asia. Here we read of the original Ionian cities which are spread along the littoral of the Gulf of Corinth, the northern Peloponnese. Although they are not detailed by inter-distance, the comments by Herodotus can be tested against a second text, although some 600 years later, by Pausanius. Unfortunately, Pausanius has chosen to write his text in a west/east direction contrary to that of Herodotus. He also names more cities and indicates that some of those quoted by Herodotus are in fact not coastal cites despite his statement. The ancient cities though can be identified. 7.17.5; The boundary between Achaia and Elis is the River Larisus— about 30 stadia further is Dyme. 7.17.6; Its more ancient name was Paleia, but Ionians changed name. 7.18.1; Some 40 Stadia from Dyme the River Peirus flows down into the sea; on the Pierus once stood the Acaean city of Olenus. 7.18.2; About 80 stadia from the River Peirus is the city of Patrae. Not far from Patrae the River Glaucus flows into the sea. 7.18.6; — dwelling in, besides Patrae, the following towns: Mesastis, Antheia, Bolina, Argyra and Arba. 7.22.1; Pharae, a city of the Aecaeans, belongs to Patrae— the road from the city of Patrae to Pharae is 150 stadia, while Pharae is about 70 stadia inland from the coast. Near to Pharae runs the River Pierus, which in my opinion is the same as the one flowing past the ruins of Olenus. 7.22.6; Triteia, also a city of Achaia, is situated inland, but like Pharae belongs to Patrae— the distance to Triteia from Pharae is 120 stadia. 7.22.10; These cities are at some distance from the sea and completely inland (i.e.Pharae and Triteia). As you sail to Aegium from Patrae you come first to the cape called Rhium, 50 stadia from Patrae, the harbour of Panormus being 15 stadia farther from the cape. It is another 15 stadia from Panormus to what is known as the Fort of Athena. From the Fort of Athena to the harbour of Erineus is a coastal voyage of 90 stadia and from Erineus to Aegium is 60 Stadia. But, the land route is about 40 stadia less than the number here. 7.22.11; Not far from Patrae is the River Meilichus—this is on the right. Advancing from the Meilichus you come to another river, the name of which is the Charadrus. 7.23.1; After the Charadrus you come to some ruins, not at all remarkable, of the city Argyra, to the spring Argyra, on the right of the high road, and to the River Selemnus going down to the sea. 7.23.4; At some distance from Argyra is a river named Bolinaeus, and by it once stood a city Bolina. Next to it a cape juts out into the sea, and —– it is called Drepanum. Beyond the high road are the ruins of Rhypes. Aegium is about 30 stadia distant from Rhypes. 7.23.5; The territory of Aegium is crossed by a River Phoenix, and by another called Meiganitas, both of which flow into the sea. 7.24.5; Going further on you come to the River Selinus, and 40 stadia away from Aegium is a place on the sea called Helice. 7.25.5; After Helice you will turn from the sea to the right and you will come to the town of Ceryneia. It is built on a mountain above the high road. 7.25.8; On returning from Ceryneia to the high road, if you go along for a short distance you may turn aside again to Bura, which is situated on a mountain to the right of the sea. 7.25.11; The straight road from Helice to the Heracles is about 30 stadia. Going on from the Heracles you come to the mouth of a river that descends from a mountain in Arcadia and never dries up. The river itself is called the Crathis, which is also the name of the mountain where the river has its source. From this Crathis the river too by Crotina in Italy has been named. 7.25.12; By the Achaean Crathis once stood Aegae. 7.26.1; To the port of Aegeira, which has the same name as the city, it is 72 stadia from the Heracles that stands on the road to Bura. The coast town of Aegeira presents nothing worth recording; from the port to the upper city is 12 stadia. 7.26.2; Homer in his poem calls the city Hyperesia. 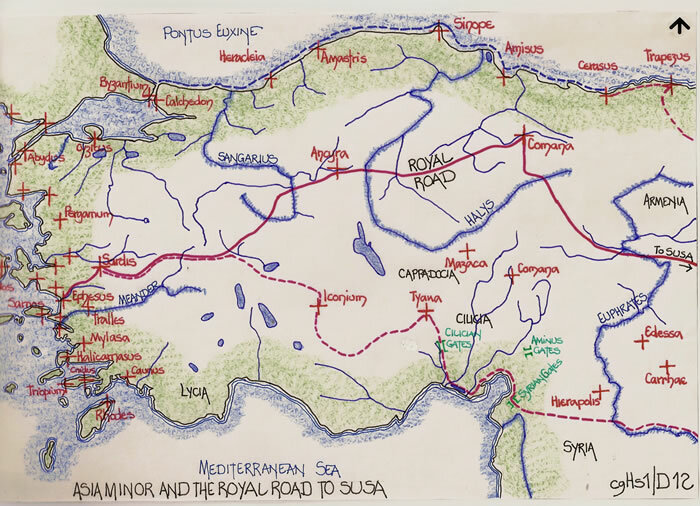 7.26.10; There is a straight road from the sanctuary of Zeus at Aegeira, passing through the mountains and steep. It is 40 stadia long, and leads to Phelloe, an obscure town. 7.26.12; The territory of Aegeira is bounded by that of Pellene, which is the last city of Achaia in the direction of Sicyon and the Argolid. 7.26.13; Between Aegeira and Pellene once stood a town, subject to the Sicyonians and called Donussa. 7.26.14; The port of Pellene is Aristonautae. Its distance from Aegeira on the sea is 120 stadia, and to Pellene from this port is half that distance. 7.27.1; The city of Pellene is on a hill which rises to a sharp peak at its summit. 7.27.9; About 60 stadia distant from Pellene is the Mysaeum, a sanctuary of the Mysian Demeter. Rivers come down from the mountains above Pellene, the one on the side nearest Aegeira being called the Crius, after, it is said, a Titan of the same name. 7.27.12; There is another river called Crius, which rises in Mount Sipylus and is a tributary of the Hermus, Where the territory of Pellene borders that of Sicyon is a Pellenian River Sythas, the last of the Aechaean rivers which flows into the Sicyonian Sea. The distances quoted by Pausanius are perhaps indistinct concerning an exact location and thus it is only possible to work from known geographical features such as the rivers. Some cities are extant, such as Patras, others have known sites, and those are helpful, but, the length of the stadion used is a problem. However, from Dyme to Pellene and Sicyon, known locations, it is possible for any researcher to attempt to answer the question of accuracy from the distances given and perhaps indicate the stadion length. It is also an aid to identifying the rivers and their sources. The Panionium is a consecrated spot on the north side of Mycale, chosen by common consent of the Ionians and dedicated to Poseidon, who was previously worshipped at Helice. Mycale itself is a promontory of the mainland running out in a westerly direction towards Samos and it is here that the Ionians gathered from their various cities to keep the festival called Panionia. The names of Festivals, not only amongst the Ionians but amongst all Greeks, end, like the Persian proper names, in the same letter. 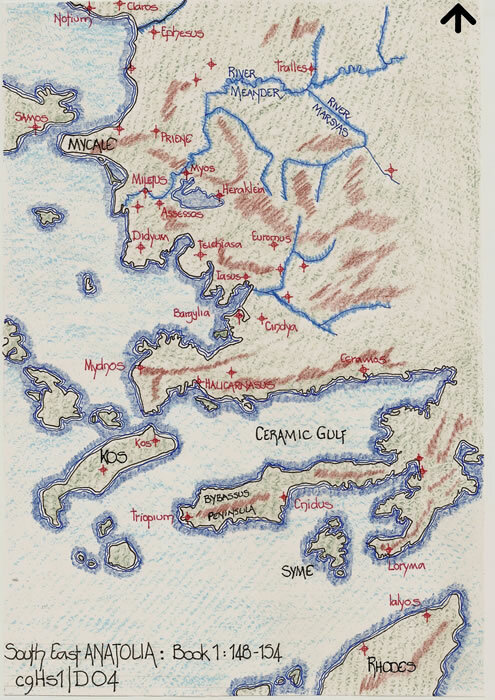 Those I have mentioned, then, are the 12 towns of the Ionians; the Aeolic towns are Cyme (also known as Phriconis), Larissa, Neon Tichus, Temnus, Cilla, Notium, Aegiroessa, Pitane, Aegaeae, Myrina, and Grynea. These are the 11 ancient towns of the Aeolians. Originally, indeed, they had 12 on the mainland, as the Ionians did, but one of them- Smyrna- the Ionians took from them. The soil of Aeolis is better than that of Ionia, but the climate is not so good. These then are the Aeolian settlements on the mainland, excluding those about Mount Ida which are not part of the confederacy. Of the island settlements, Lesbos has 5 (the sixth, Arisba, was taken by the Methymnaeans, their kinsmen, and the inhabitants enslaved), Tenedos one, and the so-called Hundred Isles one more. The Aeolians of Lesbos and Tenedos, like the Ionian islanders, had at this time nothing to fear. The other Aeolians came to a general agreement to follow the Ionians in whatever course they should take. There is an immediate change of location within the text of Herodotus from the northern Peloponnesus to the eastern shores of Anatolia within a couple of paragraphs, and without a statement to that effect. His readers are expected to know that Ionia was now part of Anatolia and no longer Greece. Pactyes (a Lydian), when he learnt that an army was on his tracks and already near, took fright and fled to Cyme, and Mazares the Mede marched to Sardis—. Branchidae is in Milesian territory close to the harbour of Panormus—-. The Phocaeans were the first Greeks to make long sea voyages; it was they who showed the way to the Adriatic, Tyrrhenia, Iberia and Tartessus. The Phocaeans made an offer for the islands known as the Oenussae, but the Chians, who were afraid that they might be turned into a new centre of trade to the exclusion of their own island, refused to sell; so the Phocaeans prepared to sail to Corsica, where 20 years previously on the advice of an oracle they had founded a city called Alalia. Phocaea is one of the twelve cities of Ionia, it is southwest of Cyme. The islands of the Oenussae are in fact northwest of the four islands of Ionia opposite Erythrae, an Ionian colony that is opposite Chios itself. The city of Alalia Corsica is on the east coast. The Oenussae is also used for Magna Graecia. Such was the fate of this section of the Phocaeans. Those who went off to Rhegium made it the base from which they afterwards sent men to found a new city in Oenotria. It is known today as Elae. —- So much for the Ionian city of Phocaea. The men of Phocaea and Teos were the only Ionians who preferred voluntary exile to the prospect of slavery. In spite of their defeat the Ionians continued the practice of meeting at the Panionium— proposal made—that was, that all the Ionians should unite and sail for Sardinia and settle together in a single community; there, living in the biggest island in the world—. Rhegium is now Reggio di Calabria on the ancient Via Aquilia opposite the island of Sicily on the mainland of Italy. 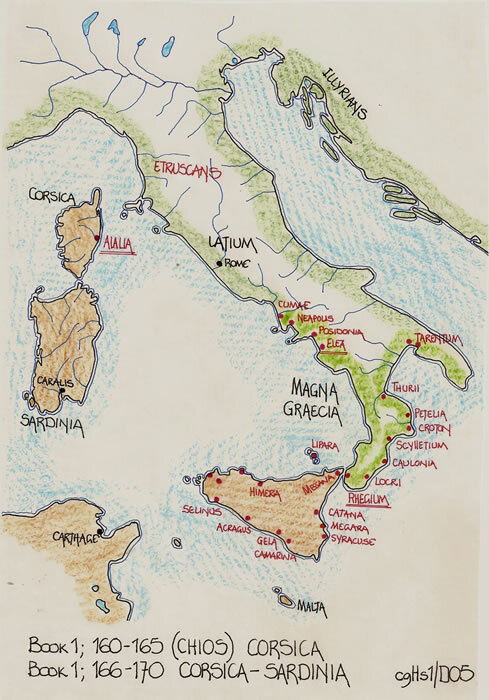 Oenotria is in Magna Graecia, which is the whole of the southern foot and heel of Italy. The Lycians came originally from Crete, which in ancient times was occupied entirely by non-Greek peoples. The two sons of Europa, Sarpedon and Minos fought for the throne, and the victorious Minos expelled Sarpedon and his party. The exiles sailed for Asia and landed on Milyan territory, Milyas being the ancient name of the country where the Lycians live today, though it was occupied then by the Solymi. During the rule of Sarpedon, the Lycians were known as the Termilae, the name they had brought with them from Crete. This narrow neck of land protrudes from the Anatolian mainland between the islands of Kos and Rhodes and has at its western extremity the city of Triopium. Cnidus is midway along the southern shore opposite the island of Syme. The Ceramic Gulf has to its north the City of Halicarnasus (now Bodrum) which is the birth place of Herodotus. Having subdued the rest of the continent, he (Harpagus) turned his attention to Assyria, a country remarkable for the number of great cities it contained, and especially for the most powerful and renowned of them all- Babylon, to which the seat of government was transferred after the fall of Nineveh. Babylon lies in a wide plain, a vast city in the form of a square with sides nearly 14 miles long and a circuit of some 56 miles, and in addition to its enormous size it surpasses in splendour any city of the known world. It is surrounded by a broad deep moat full of water, and within the moat there is a wall 50 cubits wide and 200 high (the royal cubit is three inches longer than the ordinary cubit). Eight days’ journey from Babylon there is a city called IS on a smallish river of the same name, a tributary of the Euphrates, and in this river lumps of bitumen are found in great quantity. This was the source of supply for the bitumen used in building the wall of Babylon. The Euphrates, a broad, deep, swift river which rises in Armenia and flows to the Persian Gulf, runs through the middle of the city and divides it in two. Babylon, famed for the Tower of Babel and one of the seven wonders of the ancient world, The Hanging Gardens, is today no more than many such cities, a pile of mud bricks. An attempt has been made to reconstruct part of it, but the foregoing description can in no way be portrayed there. It was Semiramis (Queen) who was responsible for certain remarkable embankments on the plain outside the city, built to control the river which until then used to flood the whole countryside. For instance, she changed the course of the Euphrates, which flows through Babylon. Its course was originally straight, but by cutting channels higher upstream she made it wind about with so many twists and turns that it actually passes a certain Assyrian village called Ardericca three separate times, so that anyone to-day who travels from the Mediterranean to Babylon and comes down the Euphrates finds himself three times over at Ardericca, on three different days. In the text of Paulus Orosius there is a description of Semiramis and the history within his Book 1, which is the geographical History of the world c350AD. The text is available on line and can be shown to draw its information from many ancient texts such as The Histories.. The expedition of Cyrus was directed against her son (King of Assyria) —, but also with water from the Choaspes, a river which flows past Susa. No Persian King ever drinks water of any other stream. On his march to Babylon Cyrus came to the River Gyndes which rises in the Matienian mountains, runs through the country of the Dardanes and then joins the Tigris which passes the city of Opis and flows into the Persian Gulf. The River Choaspes is now called the River Karkheh which flows down from the northern hills, the Zagros, and has carved for itself a deep furrow through this ancient landscape. The River Gyndes joins the Tigris near Ctesiphon and is now the Kerah River. It should be borne in mind that the estuaries of the rivers Euphrates, Tigris, Choaspes and Gyndes have altered much in the millennia of this storyline. The flood of silt will have been similar to the Nile and have increased the land boundary into the Persian Gulf considerably and thus the separate rivers made quite indistinct along the marsh area of the great tributaries. The rainfall of Assyria is slight and provides enough moisture only to burst the seed and start the root growing, but to swell the grain and bring it to maturity artificial irrigation is used, not, as in Egypt, by the natural flooding of the river, but by hand-worked swipes. Like Egypt, the whole country is intersected by dykes; the largest of them has to be crossed in boats and runs in a south-easterly direction from the Euphrates until it joins another river, the Tigris, on which Nineveh was built. After the conquest of Assyria, Cyrus’ next desire was to subdue the Massagetae, whose country lies far to the eastward beyond the Araxes, opposite the Issedones; they are reputed to be a numerous and warlike people and some suppose them to be of Scythian nationality. The Araxes is said by some to be bigger than the Danube, by others to be not so big. It is said to have a number of islands in it as large as Lesbos. Like the Gyndes, which Cyrus divided into 360 channels, the River Araxes rises in the country of the Matieni. It has 40 mouths, all but one issuing into swamp and marsh-land, where men are said to live who eat raw fish and dress in seal-skins; by the remaining mouth it flows clear into the Caspian Sea. On the west, then, the Caspian is bounded by the Caucasus; eastwards lies an immense tract of flat country over which the eye wanders till it is lost in the distance. The greater part of this region is occupied by the Massagetae, whom Cyrus wished to attack. Cyrus, therefore, having failed to achieve his object by cunning, turned to open force, and advancing to the Araxes began his assault upon the Massagetae by bridging the river for his men to cross and constructing upper-works on the ferry boats. For Cyrus to subjugate the Massagetae it would have been necessary for his army to circumnavigate the Caspian Sea. Assyria from whence he commenced was basically a swathe of land from the Mediterranean Sea to the mid-waters of the Euphrates/Tigris lands, with its cities of Nineveh and Nimrud. This land area is northwest of Susa, Cyrus’s capital on the River Choaspes. A curiosity of this tale is that the Assyrian Kingdom including its cities were virtually wiped out c608BCE by the Babylonians, and hence Cyrus II actually conquered the Babylonian Empire making it part of Persia. The Persian Empire grew and Cyrus expanded to the Rives Araxes and Cyrus in Armenia/Azerbaijan. But is that the text story of Herodotus; it appears not. The Massagetae are a tribal grouping to the north and east of the Aral Sea, which is itself to the east of the Caspian Sea. For the Araxes River to be bigger than the Danube and support an island the size of Lesbos and flow into the Caspian Sea with a huge estuarine feature there is only one contender, the River Volga. In comparison all other rivers are minor, including the original Araxes/Cyrus in Armenia. The Matieni are a tribal grouping situate north of the Caspian Sea, not merely just north of the Caucasus Mountains of the Araxes and Cyrus Rivers. The Araxes of Armenia is not a river to be bridged and use ferry boats upon, it is to the west of the Caspian Sea, but the broad estuary of the River Volga would provide for those practices. Thus the battle against the Massagetae where Cyrus was killed in c529BCE, within a day’s march of the Volga River took place on the broad plains of Kazakhstan where the horse was master, and no doubt the Persian Chariot capable of being used. These are the Russian Steppes and now the tribes north of the Caspian Sea are known as Sarmatians, with the Scythians to their west and the Sakas/Massagetae to their east. But with such a positive statement from Herodotus regarding the Caspian Sea, why do we read of geographers and cartographers linking it to the northern ocean. Is it because the Volga is such a great estuarine river that it was perceived as an inlet from that ocean, and why is the Aral missing? The measurements of the Caspian Sea can be explained quite simply when the sailing method is taken into account. An oared boat would of necessity hug the shore line and require to put ashore at least twice a day, midday and evening. The length of the Caspian Sea is therefore in all probability from the southeast corner, probably what is now Gorgan, via the south, west and north to the Ural River mouth and what is now the town of Atyrau. The width would be determined by an oared boat travelling from Baku to what is now Turkmenbasy in Turkmenistan, via the southern shore line. This is the ancient access to the Uzboy River and the trade route across to the Aral Sea and the rivers Oxus and Jaxartes. Thus the voyage timescales are quite acceptable as quoted (text cgAr1). The following is a general description of the physical features of Egypt. If you take a cast of the lead a day’s sail off-shore, you will get11 fathoms, muddy bottom- which shows how far out the silt from the river extends. The length of the Egyptian coastline (defining Egypt as we do from the Gulf of Plinthine to Lake Serbonis which lies along the base of Mt Casius) is 60 schoeni – the schoenus being an Egyptian measure equivalent to 60 stadia. The people there who own very little land measure it by fathoms; those not so poor, by stadia, or furlongs; those with much land in parasangs, and those with vast estates in schoeni. The parasang is equal to 30 stadia, the schoenus, as I have said, to sixty. Thus the coastline of Egypt is 3600 stadia in length. From the coast inland as far as Heliopolis –just about the same distance as along the road from the Altar of the 12 gods in Athens to the Temple of Olympian Zeus at Pisa – the country is broad and flat, with much swamp and mud. In point of fact these two distances –from Heliopolis to the sea. And from Athens to Pisa- are not exactly the same, but very nearly: careful reckoning would show that they differ by only 15 stadia. The latter is 15 short of the 1500: the former just a round number -1500 precisely. Southward of Heliopolis the country narrows. It is confined on the one side by the range of the Arabian Mountains which run north and south and then continue without a break in the direction of the Arabian Gulf. In these mountains are the quarries where the stone was cut for the pyramids at Memphis. This is the point where the range changes its direction and bends away towards the Arabian Gulf. I learnt that its greatest length from east to west is a two-month’ journey and that towards its eastern limit frankincense is produced. On the Libyan side of Egypt there is another range of hills where the pyramids stand; these hills are rocky and covered with sand, and run in a southerly direction like the Arabian range before it bends eastward. Above Heliopolis, then, for a distance of four days’ voyage up the river Egypt is narrow, and the extent of territory, for so important a country, is meagre enough. Between the two mountain ranges- the Libyan and Arabian- it is a level plain, in its narrowest part, so far as I could judge, not more than 200 furlongs across. South of this the country broadens again. From Heliopolis to Thebes is a nine days’ voyage up the Nile, a distance of 81 schoeni or 4860 stadia. Putting together the various measurements I have given, one finds that the Egyptian coastline is , as I have said, about 420 miles in length, and the distance from the sea inland to Thebes about 714 miles. It is another 210 miles from Thebes to Elephantine. My own observation bears out the statement made to me by the priests that the greater part of the country I have described has been built up by silt from the Nile. I formed the opinion that the whole region above Memphis between the two ranges of hills was originally a gulf of the sea, and resembles (if I may compare small things with great) the country around Troy, Teuthrania, Ephesus and the plain of the Meander- not that any of the rivers which have caused the alluvial deposits in those neighbourhoods are comparable in size to any one of the 5 mouths of the Nile, which have effected important changes in the coastline: for instance, the Achelous which flows through Acarnania and has already joined to the mainland half the islands of the Echinades group. In Arabia not far from Egypt there is a very long narrow gulf running up from the Red Sea (as it is called). It is only half a day’s voyage across in its narrowest part, but its length from its extreme limit to the open sea is a voyage of 40 days for a vessel under oars. It is tidal. Now it is my belief that Egypt itself was originally some such arm of the sea- there were two gulfs, that is , one running from the Mediterranean southwards towards Ethiopia, and the other northwards from the Indian Ocean towards Syria, and the two almost met at their extreme ends leaving only a small stretch of sea between them. Suppose, now that the Nile should change its course and flow into this gulf- the Red Sea- what is to prevent it from being silted up by the stream within, say 20000 years? Personally I think even 10000 would be enough. That being so, surely in the vast stretch of time which has passed before I was born, a much bigger gulf than this could have been turned into dry land by the silt brought down by the Nile – for the Nile is a great river and does, in fact, work great changes. So I not only believe the people who gave me this account of Egypt, but my own conclusions strongly support what they have said. I have observed for myself that Egypt at the Nile Delta projects into the sea beyond the coast on either side; I have seen shells on the hills and noticed how salt exudes from the soil to such an extent that it affects even the pyramids; I have noticed, too, that the only hill where there is sand is the hill above Memphis, and – a further point- that the soil of Egypt does not resemble that of the neighbouring country of Arabia, or of Libya, or even Syria (the Mediterranean coast of Arabia is inhabited by Syrians), but it is black and friable as one would expect of an alluvial soil formed of the silt brought down by the river from Ethiopia. The soil of Libya is, as we know, reddish and sandy, while in Arabia and Syria it has a larger proportion of stone and clay. I had from the priests another striking piece of evidence about the origin of the country: namely that in the reign of Moeris the whole area below Memphis used to be flooded when the river rose only 12 feet – and when I got that information Moeris had been dead for less than 900 years. Today, however, the river never floods unless it rises at least 23 ½ or 24 feet. It seems to me therefore that, if the land continues to increase at the same rate in height and extent, the Egyptians who live below Lake Meoris in the Delta and thereabouts will, if the Nile fails to flood, suffer permanently the same fate as they said would some day overtake the Greeks; for when they learned that all Greece is watered by rain and not, as Egypt is, by the flooding of rivers, they remarked that the day would come when the Greeks would be sadly disappointed and starve—. The Ionians maintain that Egypt proper is confined to the Nile Delta, a stretch of country running along the coast from what is known as Perseus’ Watchtower to the Pelusian Salt-pans- a distance of 40 schoeni- and inland as far as Cercasorus, where the Nile divides into two branches which enter the sea at Pelusium and Canopus. The name of Egypt was in ancient times given to Thebes, the whole circumference of whose territory is only 6120 furlongs. If, then, my judgement is correct, the Ionians are mistaken in their opinions about Egypt; if, on the other hand, the Ionians are right, I am ready to prove that neither they nor the rest of the Greeks know how to count: for they hold that the world consists of three parts –Asia, Europe, and Libya- whereas it is obvious that they should add a fourth, namely the Egyptian Delta, since they do not include it in either Asia or Libya. According to their theory the Nile is the boundary between Asia and Libya; but the Nile splits at the apex of the Delta and flows round it, thus making it a separate tract of land lying between the two. About the Ionians’ opinion I have said enough; here now is my own: Egypt, I consider, is the whole extent of territory inhabited by Egyptians, just as Cilicia is the country occupied by Cilicians or Assyria the country occupied by Assyrians. The only true boundary between Asia and Libya is formed by the frontiers of Egypt. By the usual Greek reckoning we should have to suppose that Egypt, all the way from the Cataracts and Elephantine, is cut in two, one half belonging to Libya and the other to Asia; for the Nile divides, flowing from the cataracts to the sea right through the middle of the country –as far as Cercasorus in a single stream, and below that city splitting into three branches, of which one trends eastward and is known as the mouth of Pelusium, and another trends westward and is called the mouth of Canopus. There remains the third branch which, coming down from the southward to the tip of the Delta, flows straight on and cuts it in two, on its course to the sea. This branch, issuing at what is called the mouth of Sebennytus, is neither the least in volume, nor the least famous of the three. In addition to these there are two other mouths, the Saitic and Mendesian, which split off from the Sebennytic and so run to the sea. The Bolbitine and Bucolic mouths are not natural branches but excavated channels. 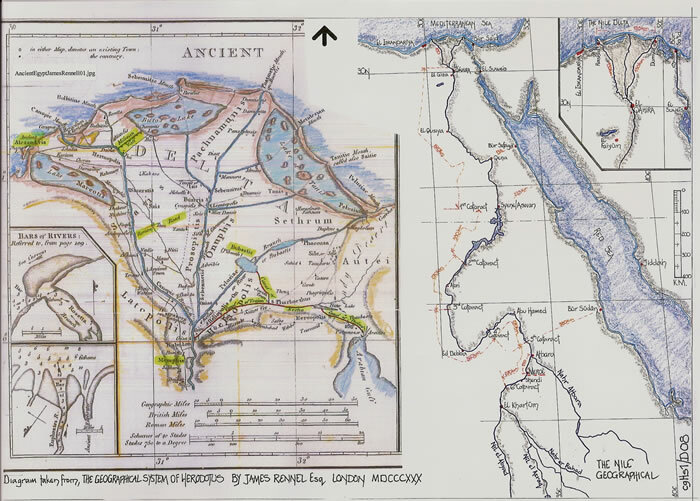 The route of the Nile and its various measurements are covered in my text Es2. Concerning the sources of the Nile, nobody I have spoken with, Egyptian, Libyan, or Greek, professed to have any knowledge, except the scribe who kept the register of the treasures of Athene in the Egyptian city of Sais. But even this person’s account, though he pretended to exact knowledge, seemed to me hardly serious. He told me that between Syene, near Thebes, and Elephantine there were two mountains of conical shape called Crophi and Mophi; and that the springs of the Nile, which were of fathomless depth, flowed out from between them. Half the water flowed northwards towards Egypt and half southwards towards Ethiopia. On this subject I could get no further information from anybody. As far as Elephantine I speak as an eye-witness, but further south from hearsay. The most that I could learn was that beyond Elephantine the country rises steeply; and in that part of the river boats have to be hauled along by ropes- one rope on each side- much as one drags an ox. The conditions last over a four days journey, the river all the time winding greatly, like the Meander. And the distance to be covered amounting to 12 schoeni. After this one reaches a level plain, where the river is divided by an island named Tachompso. South of Elaphantine the country is inhabited by Ethiopians who also possess half of Tachompso, the other half being occupied by Egyptians. Beyond the island is a great lake, and round its shores live nomadic tribes of Ethiopians. After crossing the lake one comes again to the stream of the Nile, which flows into it. At this point one must land and travel along the bank of the river for 40 days, because of sharp rocks, some showing above water and many just awash, make the river impractical for boats. After the 40 days’ journey on land one takes another boat and in 12 days reaches a big City named Meroe, said to be the capital city of the Ethiopians. The course of the Nile is, then, known not only where it traverses Egypt but as much further southward as one can travel by land or water in four months; for calculation will show that this is the time it takes to go from Elephantine to the Deserters. At that point the river runs from west to east; beyond, nobody knows its course with any certainty, for the country is uninhabited because of the heat. The river which flows past their town was supposed by Etearchus, reasonably enough, to be the Nile; for the Nile does in fact flow from Libya, dividing it in two and (to argue by analogy from the known to the unknown) I am willing to believe that it rises at the same distance from its mouth as the Danube, which has its source amongst the Celts near Pyrene and flows right through the middle of Europe, to reach the Black Sea at the Milesian Colony of Istria. (The Celts live beyond the Pillars of Hercules, next to the Cynesians who are the most westerly people of Europe). Its course is quite familiar because it flows through inhabited country; but nobody, on the other hand, knows anything about the source of the Nile, because that river runs through a part of Libya which is uninhabited and desert. All I could possibly learn by enquiry about its course, I have here set down. It enters Egypt from the country beyond. Egypt is more or less opposite to, or south of, the mountainous parts of Cilicia, from which the direct route to Sinope on the Black Sea takes 5 days for a man travelling light; and Sinope lies opposite the mouth of the Danube. It is my belief, then, that the Nile, as it traverses the whole of Libya, is equal in length to the Danube- and on that subject I shall say no more. The Danube is seen as the mightiest river of Europe. Rising in Southern Germany not far from the source of the River Rhine, it flows east to Budapest, then southerly and then easterly again until the final small changes of direction which precede its entry into the Pontus Euxine or Black Sea. It is the River Ister of Book 4, 46-50, a river navigable by sea-going vessels. Unfortunately Sinope does not lie opposite the mouth of the Danube but opposite the mouth of the Sea of Azov and thus the River Tanais or Don. Psammetichus left a son, Necos, who succeeded him. It was Necos who began the construction of the canal to the Arabian Gulf, a work afterwards completed by Darius the Persian. The length of the canal is a four days’ journey by boat, and its breadth sufficient to allow two triremes to be rowed abreast. The water is supplied from the Nile, and the canal leaves the rive at a point a little south of Bubastis and runs past the Arabian town of Patumus, and then on the Arabian side of the Egyptian plain, a little to the northward of the chain of hills by Memphis, where the stone quarries are; it skirts the base of these hills from west to east, and then enters a narrow gorge, after which it trends in a southerly direction until it enters the Arabian Gulf. The shortest distance from the Mediterranean, or, Northern Sea, to the Southern Sea- or Indian Ocean- namely, Mt Casius between Egypt and Syria to the Arabian Gulf is just a 1000 stadia. This is the most direct route – by the canal, which does not keep at all a straight course, the journey is much longer. This canal from its description has possibly two routes, one through Wadi Tumilat to the Bitter lakes and then the Red Sea; the second would be south from Bubastis in a more direct route to the Red Sea. Herodotus does not mention the Great and Lesser Bitter lakes, which are a major feature of this area and part of the 19th century Suez Canal. The chain of hills which extend from Memphis, some 70Km south west, do not impinge upon the route east from Bubastis and Wadi Tumilat. 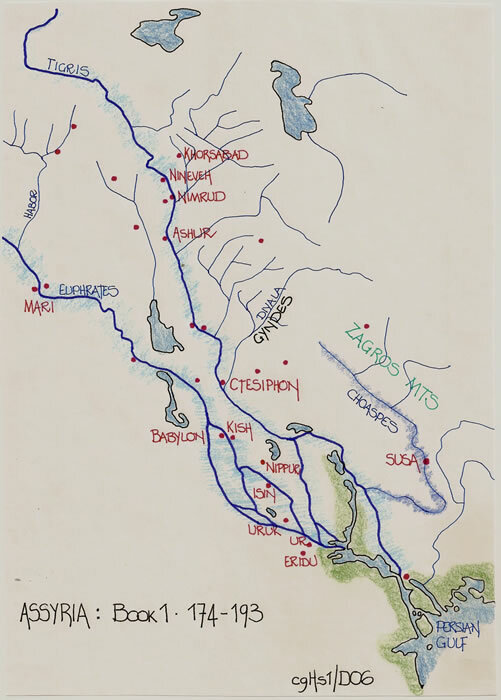 In Dicuil, Liber de Mensura Orbis Terrae, 6, para 12, he appears to confirm that this canal was still in existence and travelled upon by monks exploring the area. There is even a description of the Pyramids as Barns. Again a student of geographical history should read this text for information. Book 3, there are no references used. The Greeks of Pontus give a different account of Scythia and the country beyond it. According to them, Heracles came into this part of the world, which was then uninhabited, with the oxen of Geryon. Geryons’ home was far away, on an island which the Greeks call Erythea, near Gades, which lies on the Ocean beyond the Pillars of Heracles. Legend says, that Ocean is a great river running from the east all round the world; but there is nothing to prove this. There is an island in the ocean not far from the Pillars, now Madeira. Gades or Cadiz was originally an island very close to the mainland and could not therefore be a misnamed place. Although it is always referred to as an island it in fact was causewayed early on thus it may be considered a misnomer. Even Aristeas, whom I have just mentioned, does not pretend in his poem to have gone further than the country of the Issedones, and admits that his account of what lies beyond is mere hearsay, founded on tales which the Issedines told him. I will nevertheless, put down everything which careful enquiry about these remote parts has brought to my notice. West of the sea-port at the mouth of the Borysthenes (Dnieper) – which lies in the middle of the Scythian coastline – the first people are the Graeco-Scythian tribe called Callipidae, and their neighbours to the eastward are the Alizones. Both these peoples resemble Scythians—. North of the Alizones are agricultural Scythian tribes— beyond these are the Neuri, and north of the Neuri the country, so far as we know, is uninhabited. So much for the peoples along the Hypanis (Bug), west of the Borysthenes; east of the Borysthenes, starting from the sea one comes first to Hvlaea- the Woodland- to the northward of which are Scythians who get their living from the land and are known to the Greeks on the River Hypanis as Borysthenites. They call themselves Olbiopolites. These Scythians extend eastward as far as a river named Panticapes –the distance of a three days’ journey – and northward as far up the Borysthenes as a boat can sail in 11 days. Further north is a great tract of uninhabited desert, beyond which live the Androphagi- the maneaters- who have no connexion with the Scythians but are a quite distinct race. Northward again, so far as we can tell, there is utter desert without trace of human life. Eastward of the Scythians who lived off the land, and on the other side of the Panticapes, are the nomadic Scythians, who know nothing of Agriculture. All this region with the exception of Hylaea is treeless. The nomadic tribes are to be found over a stretch of country extending eastward 14 days’ journey as far as the Rver Gerrhus, on the further side of which lies what is called the country of the Kings, and the Royal Scythians, who are the most warlike and numerous section of their race, and look upon the others as their slaves. Their territory runs south as far as Taurica (Crimea) and east to the trench which was dug by the sons of the blind slaves, and to the Cremni, the trading post on the shore of the Sea of Azov. Part of it reaches as far as the River Tanais (Don). 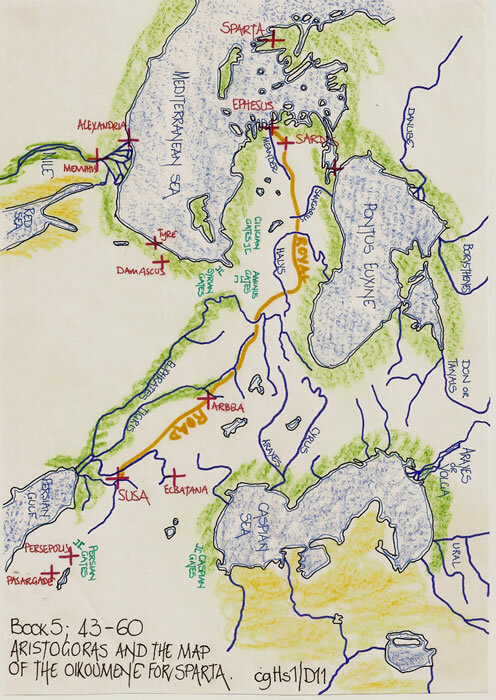 North of the Royal Scythians is a non-Scythian race called Melanchlaeni, or Black-Cloaks, and north of them, so far as one knows, is a region of lakes and uninhabited country. Once across the Tanais, one has left Scythia behind, and comes first to the Sauromatae, who occupy a stretch of country which runs northward 15 days’ journey from the northern tip of the Sea of Azov, and is entirely bare of trees, wild or cultivated. The next region beyond the Sauromatae belongs to the Budini, and is plentifully supplied with timber of all sorts. Northward again the country is uninhabited over the distance of a 7 days’ journey, until by turning a little easterly one come to the Thyssagetae, a distinct and numerous race which gets its living from hunting. These folk live along-side another tribe called Iyrcae,—. Further to the north and east lives another Scythian tribe, which moved to these parts after some trouble with the Royal Scythians to which it originally belonged. As far as this, the country I have been describing is a level plain with good deep soil, but further on it becomes rugged and stony; beyond this region, which is of great extent, one comes to the foothills of a lofty mountain chain, and a nation of bald men,——- they are called Argippaei. I cannot help laughing at the absurdity of all the map-makers – there are plenty of them- who show Ocean running like a river round a perfectly circular earth, with Asia and Europe of the same size. Let me spend a few words in giving a proper notion of the size and shape of these two continents. Persian territory extends southward to the Red Sea, as it is called; north of them are the Medes, then the Saspires, then the Colchians, who go as far as the Northern Sea (Black Sea), where the mouth of the Phasis is. These four nations fill an area between the Black Sea and the Persian Gulf. Thence run westward two great continental promontories, one of which stretches from the Phasis on the north along the Black Sea and the Hellespont to the Mediterranean at Sigeum in the Troad (Yenicher) and again, in the south, along the Mediterranean coast from the Myrandic Gulf, near Phoenicia, to Cape Triopium (Krio Isostris). This branch of the continent contains 30 different nations. The other starts from Persia, and embraces successively Persia, Assyria, and Arabia, and ends – or is assumed to end- at the Arabian Gulf (Red Sea), which Darius connected by canal with the Nile. Between Persia and Phoenicia lies a very large area of country; and from Phoenicia the branch I am speaking of runs along the Mediterranean coast through Palestine-Syria to Egypt, where it ends. It contains only three nations. Such is Asia from Persia westward; eastward, beyond Media and the territories of the Saspires and Colchians, lies the Red Sea (Indian Ocean) and, at the northern limit, the Caspian Sea and the River Araxes, which flows eastwards. Asia is inhabited as far as India; further east the country is uninhabited, and nobody knows what it is like. Such then are the shape and size of Asia. Libya is part of the second branch I mentioned, for it adjoins Egypt; Egypt itself forms a narrow neck, only about 120 miles across from the Mediterranean to the Red Sea; but it soon broadens out, and what is known as Libya covers a very large area. In view of what I have said, I cannot but be surprised at the method of mapping Libya, Asia, and Europe which I mentioned a page or two back. The three continents do, in fact, differ very greatly in size. Europe is as long as the other two put together, and for breadth is not, in my opinion, even to be compared with them. As for Libya, we know that it is washed on all sides by the sea except where it joins Asia, as was first demonstrated, so far as our knowledge goes, by the Egyptian King Neco, who, after calling off the construction of the canal between the Nile and the Arabian Gulf, sent out a fleet manned by a Phoenician crew with orders to sail round and return to Egypt and the Mediterranean by way of the Pillars of Heracles. The Phoenicians sailed from the Red Sea into the southern ocean, and every autumn put in where they were on the Libyan coast, sowed a patch of ground, and waited for next year’s harvest. Then, having got in their grain, they put to sea again, and after two full years rounded the pillars of Heracles in the course of the third, and returned to Egypt. Those men made a statement which I do not myself believe, though others may, to the effect that as they sailed on a westerly course round the southern end of Libya, they had the sun on their right- to the northward of them. This is how Libya was first discovered to be surrounded by sea, and the next people to make a similar report were the Carthaginians; —. The greater part of Asia was discovered by Darius. He wanted to find out where the Indus joins the sea- the Indus is the only river other than the Nile where crocodiles are found – and for this purpose sent off an expedition down the river a number of men whose word he could trust. Led by a Caryandian named Scylax, the expedition sailed from Caspatyrus in the district of Pactyica, following the course of the river eastward until it reached the sea; then, turning westward, the ships followed the coast, and after a voyage of some 30 months reached the place which the King of Egypt had sent out the Phoenicians, whom I have already mentioned, to circumnavigate Libya. With Europe, however, the case is different; for no one ever determined whether or not there is sea either to the east or to the north of it; all we know is that in length it is equal to Asia and Libya combined. Another thing that puzzles me is why three distinct women’s names should have been given to what is really a single land-mass; and why, too, the Nile and the Phasis – or according to some, the Maeotic Tanais and the Cimmerian Strait- should have been fixed upon for the boundaries. “Skylax of Karyanda, his circumnavigation of the inhabited sea, Europe, Asia and Libya, and how many and of what kind are the several nations in sequence, and territories and harbours and rivers, and how great are the lengths of the voyages, and the (seven) islands that are inhabited, in what manner each lies in relation to the mainland.” (Skylax = 6/5th century BCE, pseudo Skylax probably 3rd century BCE). 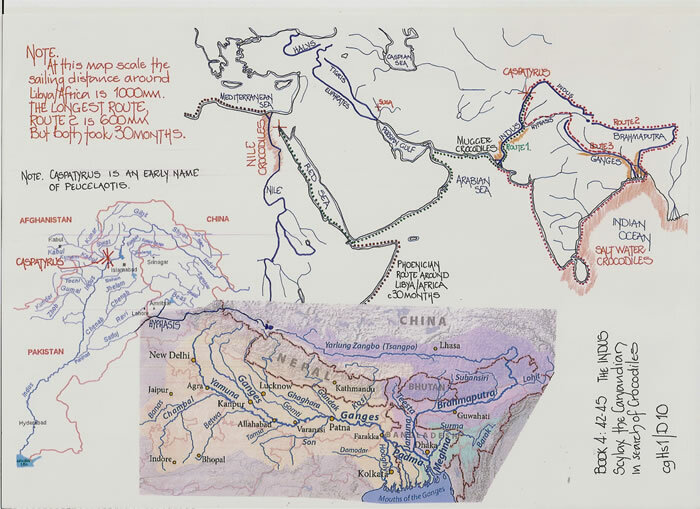 If Skylax led an expedition from the Indus (Ganges) to the Red Sea gulf, which was the start point for the voyage by explorers of King Necos, then that voyage is missing from his text? The voyage of Hanno the Carthaginian, 6th c, BCE as discussed in my text Cp4 is pertinent. The actual journey time of Skylax as given is questionable. Herodotus informs us that the circumnavigation of Africa took only 30 months, but here he informs us that Skylax took 30 months to travel, at what is the longest we can perceive, only 60% of that journey and at its shortest variant only 30% of the African route. Although the two stories follow one another in the text, the lengths of voyage are noted differently and thus are probably not copyist error. The fact that Skylax travels east to find the crocodiles when the Indus is a southerly flowing river, and that the Mugger Crocodile, a small variant, is known to exist in the rivers of southern Persia also indicates that the Crocodile sought, close to the size of the Nile Crocodile is the salt water variant, an eater of man. This crocodile is only found on the eastern coastline of India from Sri Lanka north to the Ganges Delta ( and thence south to Singapore). Thus the route taken must have been easterly either along the upper Indus to the junction with the tributary of the Brahmaputra River in Tibet, or they crossed many rivers to reach the tributaries of the Ganges and thence to the sea. Thus the journey length is a variable, but certainly via the Indus no a 30 month journey. Round the Black Sea- the scene of Darius’ campaign – are to be found, if we except Scythia, the most uncivilised nations in the world. The best known of the rivers, those, namely, which are navigable by sea-going ships, I will mention: they are the Ister (Danube) which has five mouths, The Tyras, the Hypanis, The Borysthenes, the Pantcapes, Hypacyris, Gerrhus and Tanais. 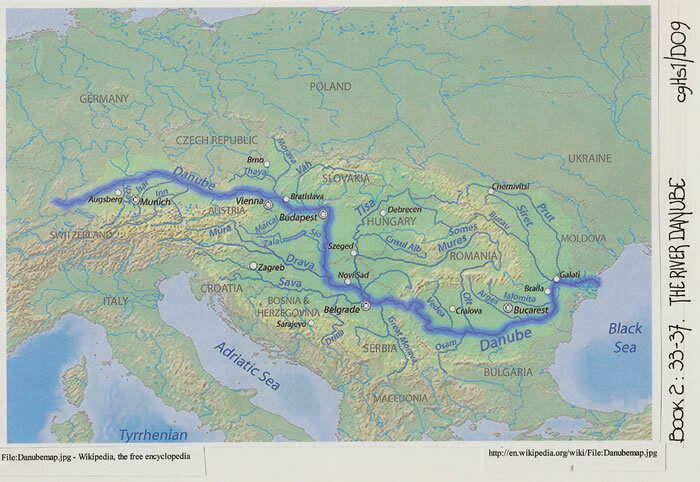 The Danube, which is the mightiest river in the known world, and never varies, summer or winter, in the volume of its waters, is the most westerly of the Scythian rivers, and owes its great size to the tributary streams which join it. 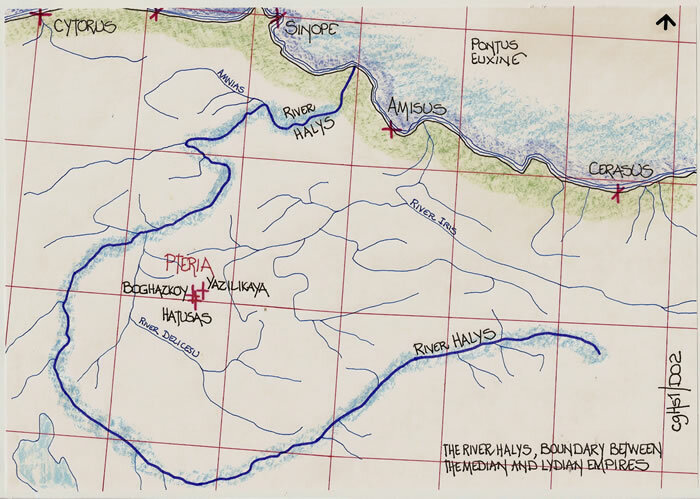 Of these tributaries, five are genuine Scythian rivers and have their source in the country: namely, the Pyretus (or Porata, as the Scythians call it), the Tiarantus, the Araros, the Naparis, and the Ordessus. The first of these –a big river- is the most easterly of the five; the second, the Tiarantus, is smaller and further west, while the Araros, the Naparis, and the Ordessus join the Danube somewhere between the two. In addition to the tributaries which can properly be called Scythian, there are also many others. (There are lists of rivers in the text which interested researchers can follow themselves. But it is evident that the names of rivers are so similar across Asia that the misnaming would be so very easy). The next river, The Tyras (Dniester), runs southward from its source in a large lake, which forms the boundary between Scythia and the country of the Neuri. Greeks called Tyritae have established a settlement at its mouth. The third river, the Hypanis (Bug), has its source in Scythia, in another great lake, round the borders of which wild white horses graze. The Tyras and the Hypanis draw close together in the country of the Alizones, but afterwards diverge, leaving a wider and wider space between them. The Borysthenes, the second largest of the Scythian rivers, is, in my opinion, the most valuable and productive not only of the rivers in this part of the world, but anywhere else, with the sole exception of the Nile- with which none can be compared. Not far from the sea the Borythsthenes (Dnieper) and Hypanis unite and flow through low-lying marsh country, and the pointed spit of land between them is called Cape Hippolaus; there is a temple of Demeter upon it, and opposite the temple, on the Hypanus, is the settlement of the Borysthenites. The fifth river, the Panticapes, also rises in a lake and flows in a southerly direction through Hylaea – the Woodland- to join the Borysthenes. The Hypacyris, the sixth river,flows from a lake right through the territory of the Scythian nomads, and reaches the sea near Carcinitis, leaving Hylaea and the place called Achilles’ Racecourse to the right. The Gerrhus splits off from the Borysthenes, far to the north at a spot which goes by the same name and lies somewhere about the region where the Borysthenes begins to be known. The eighth river, the Tanais, has its source far up country in a large lake, and empties itself into a larger one still, Lake Maeotis (Sea of Azov). 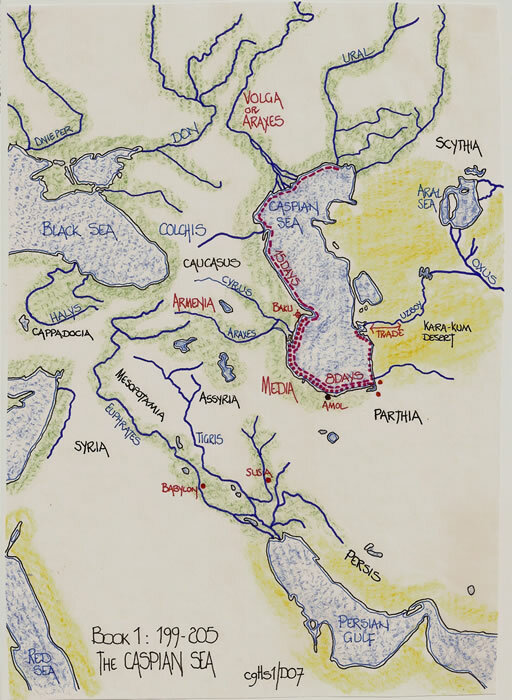 It divides Royal Scythia from the Sauromatae, and is joined by yet another river, the Hyrgis. These then are the most notable of the rivers with which Scythia is provided. Darius continued his march from Susa to Chalcedon on the Bosphorus, where the bridge was, and then took ship and sailed to the Cyanean Rocks – those rocks which according to the Greek story used to be constantly changing their position. Here, seated in the temple which stands by the straits, he looked out over the Black Sea- a sight indeed worth seeing. No sea can equal the Black Sea; it is 1380 miles long, 410 wide in its widest part. Its mouth is half a mile wide, and the length of the Bosphorus, the narrow strait which leads into it (and where the bridge was), is nearly 15 miles. The Bosphorus joins the Propontis, which is about 60 miles wide and 170 long, runs into the Hellespont, a narrow strait nearly 50 miles long but less than a mile wide. The Hellespont leads into the broad sea we call the Aegean. The foregoing measurements were arrived at in the following way; in a summer day a ship can cover a distance of approximately 70,000 fathoms, and in a night 60,000. To sail from the entrance of the Black Sea to Phasis- which represents a voyage along its greatest length- takes 9 days and 8 nights; this would make a distance of 1,110,000 fathoms, or 11.100 furlongs (1380 miles). Across the broadest part, from Sindica to Themiscyra on the Thermodon, it is a voyage of 3 days and 2 nights; this comes to 330,000 fathoms, or 3300 furlongs (410 miles). I have now given the measurements – and the method of arriving at them- of the Black Sea, Bosphorus, and Hellespont; it remains to add that the Black Sea is connected with a lake nearly as big as itself called Maeotis, or Mother of Pontus. The measurements can be assessed by anyone as they are well detailed. The rocks are part of Greek Legend, but the Maeotis is certainly not nearly as big as the Black Sea. Again this could be the ancient tale of the Maeotis when the silt levels where so very different c1000BCE and the flood plain of the Tanais spread across the landscape. A small boat requires so very little water depth! Scythia is divided from us by Thrace, which comes down to the sea. The coast sweeps round in a great bend where Scythia begins and the Danube flows eastwards into the sea. It is 10 days journey from the Danube to the Borysthenes, and another 10 to Lake Maeotis, making 20; and it is also 20 days’ journey inland from the Black Sea to the Melanchlaeni whose territory forms the northern boundary. I reckon a day’s journey at 200 furlongs, —. The following is a description of the Libyan tribes in their order: starting from Egypt, the first are the Adyrmachidae. This tribe extends from the Egyptian border as far as the port called Plynus. Next come the Giligamae, whose territory runs westward as far as the island of Aphrodisias. In between lies Platea, the island off the coast where the Cyrenaeans first settled, and on the mainland is the Harbour of Menelaus, and Aziris. Westward again are the Auschisae, who live south of Barca and touch the sea near Euesperides. Within their territory is the small tribe of the Bacales, who reach the coast near Tauchira, a town belonging to Barca. Still proceeding in a westerly direction, one comes next to the Nasamones. The neighbours of the Nasamones are the Psylli- but they no longer exist. (Territory lies wholly within the Syrtis.) Next are the Macae, then the Gindanes, the Machlyes whose territory reaches a large river called Triton, which flows into the great lagoon of Tritnis. In the lagoon is an island named Phla. The people next to the Machlyes are the Auses; both these tribes live on the shores of the lagoon, and the River Triton forms the boundary between them. Triton Fl., a river of Africa, rising in Uargala Mts., and, after forming Libya palus, Palladis Lacus, and Tritonis palus, it falls into the Mediterranean south of Tacape. The name is erroneously connected by some with the Greek Minerva, said to have been born on its banks; now the Kabes River. The Euesperides are the Hesperides, Berenice, Cyrenaica, with its capital Cyrene. The Great and Little Syrtis are the large bays between Cyrene and Carthage. This area is covered in the texts Es1 and Es2. Cleomenes, however was on the throne when Aristagoras of Miletus came to Sparta. According to the Spartan account, Aristagoras brought to the interview a map of the world engraved on bronze showing all the seas and rivers. 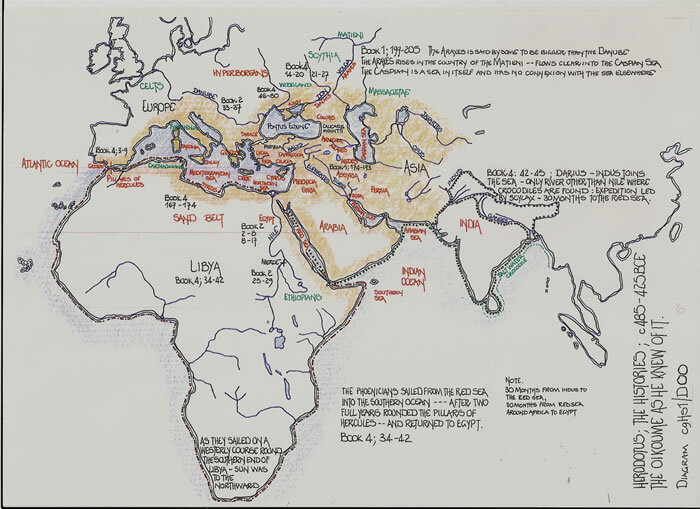 Here Aristagoras produced the map he had brought with him. “Look”, he continued, pointing to it, “next to the Ionians here are the Lydians- theirs is a fine country, rich in money. Then come the Phrygians, farther east, richest incattle and crops of all the nations we know. And here, adjoining them are the Cappadocians – Syrians, we Greeks call them; and next to them the Cilicians, with their territory extending to the coast- see, here’s the island of Cyprus- who pay annual tribute to the Persian King of 500 talents. Now, the Armenians – they, too, have cattle in abundance; next to them, here, the Matieni. Again, further east, lies Cissia; you can see the Choapses marked with Susa on its banks, where the Great King lives, and keeps his treasure. Why, if you take Susa, you need not hesitate to compete with God himself for riches. You should suspend your wars over a scrap of land- and poor land at that- with your rivals the Messenians and Arcadians and Argives, who have nothing whatever in the nature of Gold or Silver which is worth fighting and dying for, when you are offered the chance of an easy conquest of the whole land of Asia. Is there really any choice between the two? Cleomenes stopped Aristagorus from saying any more of the road to Susa. “Milesian”, he cried,”you must leave Sparta before sunset. Your proposal to take Lacedaemonians a three months’ journey from the sea is a highly improper one”. Herodotus knows that the foregoing text does not prove the journey time of 3 months, and continues thus. That information I will now supply myself. At intervals all along the road are recognised stations, with excellent inns, and the road itself is safe to travel by, as it never leaves inhabited country. In Lydia and Phrygia, over a distance of 94 ½ parasangs- about 330 miles- there are 20 stations. On the far side of Phrygia one comes to the River Halys; there are gates here, which have to be passed before one crosses the river, and a strong guard-post. Once over the river and into Cappadocia, a distance of 104 parasangs, with 28 stations, brings one to the Cilician border, where the road passes through two set of gates, both guarded. These left behind, the distance through Cilicia is 15 ½ parasangs, with 3 stations. Separating Cilicia from Armenia is a river, the Euphrates, which has to be crossed in a boat, and the distance across Armenia itself is 56 ½ parasangs, with 15 stations or stopping-places. Here, too, there is a guard. Through this part of the country 4 rivers run, all of which have to be crossed by a ferry: the first is the Tigris; the second and third both have the same names- Zabatus- though they are different rivers and flow from distinct sources, one rising in Armenia, the other in Matiene; and the fourth is the Gyndes- the river which Cyrus once split up into 360 channels. Leaving Armenia and entering Matiene, one has 137 parasangs to go, with 34 stations, and, passing thence into Cissia, another 42 ½ with 11 stations, which bing one to the River Choapses- another navigable stream- on which the city of Susa stands. Thus the total number of stations, or post-houses, on the road from Sardis to Susa is 111. If the measurement of the Royal Road in parasangs is correct, and if a parasang is equal (as indeed it is) to 30 furlongs, then the distance from Sardis to the Palace of Memnon (450 parasangs) will be 13,500 furlongs. Travelling at the rate of 150 furlongs a day, a man will take just 90 days to make the journey. So, one can see that Aristagoras of Miletus was quite right. But, if anyone wants still greater accuracy, I would point out that the distance from Ephesus to Sardis should be added to the total, so that one gets, as a final measurement of the distance from the Aegean Sea to Susa- the city of Memnon- 14040 furlongs, Ephesus to Sardis being 540 furlongs, which increase the three months’ journey by three days. The Royal Road is so well documented as to require little comment. But it indicates that distance measure was vital to the Persians, and for any army, to know travel distances, timing and food requirements. Thus as usual we find war being the great driver of knew knowledge. Books 6 and 7 have fascinating tales including geographical insight but they are minor compared to the foregoing. This whole text indicates that maps played a vital role in the Ancient Greek world. That there are many named geographers or cartographers of this age for whom we have good details also indicates that their works were highly thought of. I have therefore ended the analysis with this excellent example of Greek knowledge and hope “The Histories” will be read in full.